The immensity of the Russian territory and the vast and deep rivers which traversed its land from the Urals or the Caucasian chains played the same role as the Mississippi and its tributaries during the American civil war: Convoying troops and carrying out missions Fire support and surveillance. As a result, the USSR was the country that built the most units of its kind during the war. They proved valuable to the Wehrmacht, not being held back by the natural conditions of the bad roads during the break-up. The most common lightweight models were equipped with heavy tank turrets and machine guns, and were armored, and these units sometimes faced German panzers. 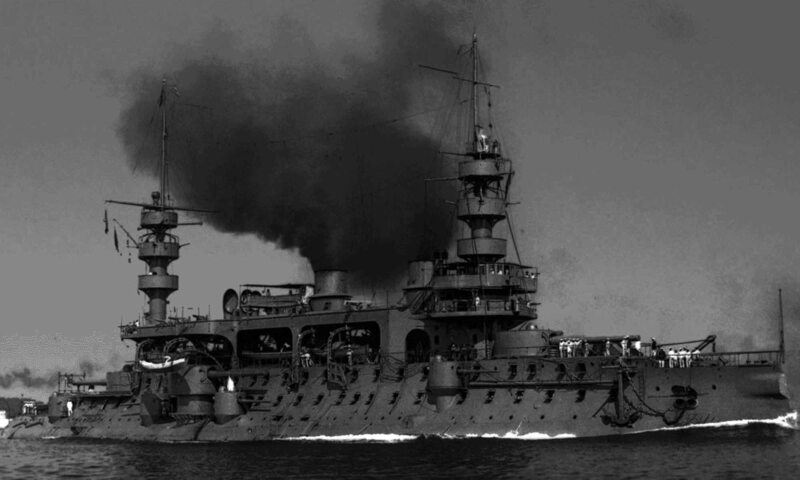 Others served as fire support ships during the great offensives, notably thanks to their “Stalin organs”. These monitors dating from before the Great War had been so well realized that they were still in proper condition after the Civil War. The Lenin, Sverdlov, Trockiy and 4 other units were re-started in 1927-34 and then in service with the fleet: Dalchevostolchnoi Komsomolec, Dzerzhinskiy *, Kirov * and Sun Yat-Sen . All survived the conflict. Some served on the Amur, on the Chinese border. 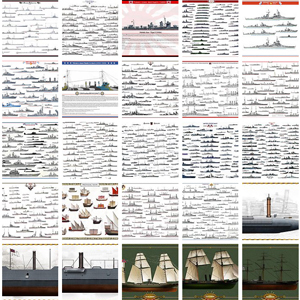 * double or triple denomination: Also name of a coastguard, and a Kirov class cruiser. Propusion: 2 screws, 2 diesels, 2200 hp. Propulsion: 2 screws, 2 diesels, 3200 hp. Built in Kiev, these two powerful sister-ship monitors of 1932 served on the Dnieper. It was there that the Udarnyi was sunk in 1941 by the Luftwaffe. Propulsion: 2 screws, 2 diesels, 1600 hp. Armour: Up to 35 mm? These 6 monitors were built in 1934-39 in Kiev to serve on the Dnieper. They were armored, and were all lost in combat except the Zheleznyakov, preserved and showcased today in Kiev. Propulsion: 2 screws, 2 diesels, 300 hp. These two monitors were built in 1943-45 in Kiev to serve on the Dnieper. They were clearly inspired by the Udarniy, and were joined by a third unit in 1946. Propusion: 2 screws, 2 diesels, 1000 hp. First constituted in June 1931, a small flotilla was disbanded in June 1940, and the ships realocated to the new Danube Flotilla created with Soviet occupation of Bessarabia and Northern Bukovina and the Pinsk Flotilla. A new Dnieper Flotilla was also constituted from ships of the Volga Flotilla in September 1943. By the time of spring 1944 offensive, the Dnieper flotilla consisted of no less than 140 boats and ships, included, in out case, 16 armored gunboats. Commander was Rear Admiral Vissarion Grigoriev. The flotilla operated on the Dnieper River and tributaries, like the Berezin, Pripyat River, Vistula and tributary the Western Bug, Oder and Spree. The Dnieper ended into the Black Sea, while the Bug, Vistula, Oder, and Spree drain into the Baltic sea. Existing canals provided links between these. 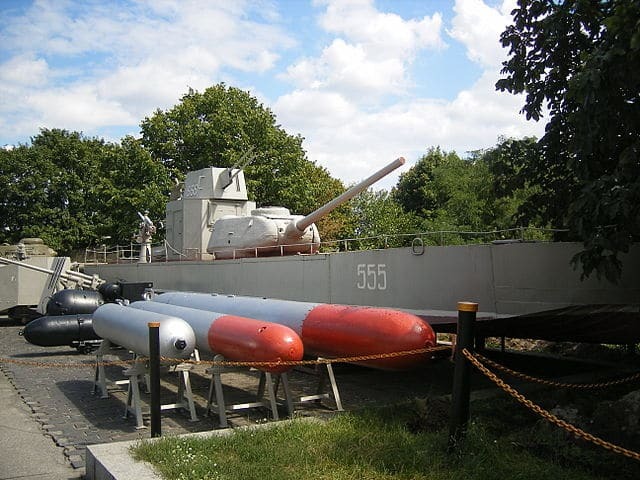 BK type gunboat preserved as a monument at Pinsk. The Flotilla’s contributed to the protect the flanks of advancing Soviet troops in Ukraine, Belarus, and Poland. Outside of logistic support, it also performed amphibious landings (Pinsk, Zdudichi, Petrikovsky, Borkinsky, and Doroshevichinsky). Units also fought on the Oder and Spree and throughout the battle of Berlin, bringing close support. The Dnieper Flotilla was disbanded afterwards. The BK armored gunboats were certainly the most common and useful. In 1941, no less than 85 of these were in service, 68 under construction, 110 on order. They paid a heavy price in operations, as about 90 were lost. Outside a T34/76 tank turret (early types had T-28 and T-35 turrets) as main armament, they also had lighter 7.62 PKT in T-28/35/26 light secondary turrets. The BK-1124 had two main turrets and BK-1125 one, with a 12.7mm DshK machine gun AA and two PKT 7.6mm machine guns, sometimes a Katiusha type rocker launcher. There were several combination known, and many vessels were camouflaged. Preserved BK-1125 at Kiev, showing its T-34/85 turret and twin 12.7 mm above the bridge. Zheleznyakov class river monitor, of which five were built at Kiev also served with the Dnieper Flotilla. Outside a twin 4-inch (100 mm) main armament, they also had 2 x 2 45 mm (1.7 in) guns, and four PKT standard machine guns. The Flotilla was awarded the Order of the Red Banner in 1944, and the Order of Ushakov, First Class, in 1945. Some subunits were made Guards or received honorary battle names (Pinsk, Bobruisk, Luninets, Berlin) as well as Three thousand soldiers and sailors has been awarded, twenty of which were made Hero of the Soviet Union. 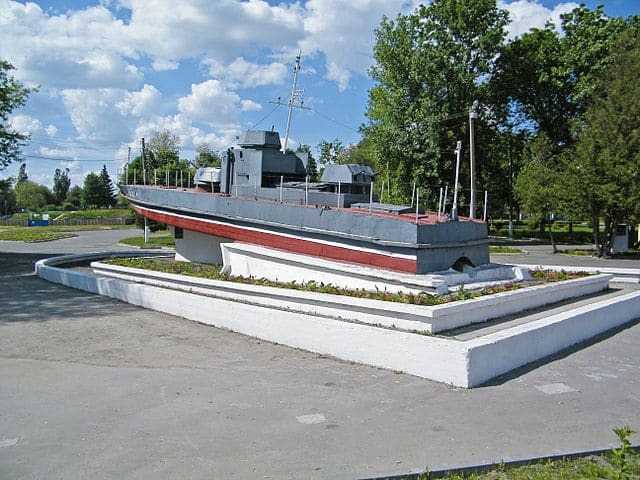 Nowadays a monument at Pinsk (BK serie ship) stands to commemorate the flotilla but others are showcased in Kiev, Mariupol, Blagoveshchensk, even Khabarovsk (far east). 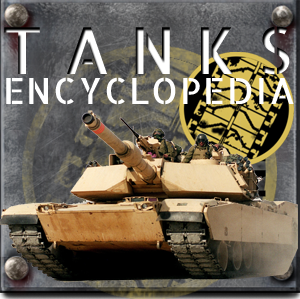 Constructed in mass since 1935, these units relied on the numerous armored gunboats deployed successfully during the civil war as well as the armored trains and on the prototypes N and K. Their peculiarity was to use turrets of Tanks, and to have the corresponding shielding. The former had heavy tank turrets T-28 and T-35, then in 1939, T-34, the standard tank of the Soviet army. About 60 were in service during the German invasion, and more than 150 were built, some equipped with rocket launchers ROFS-82 (Katiucha) fire support. Propulsion: 2 screws, 2 gasoline engines, 1600 hp. 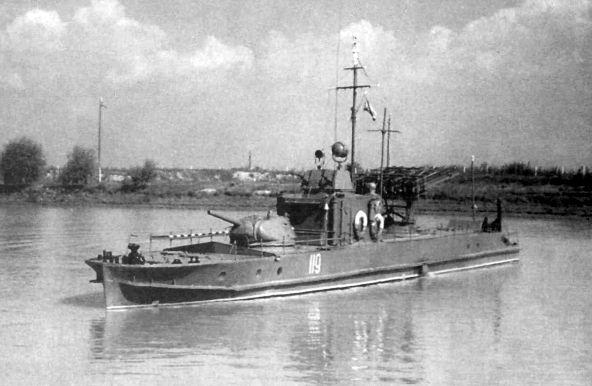 These armored gunboats, built in 1938, were derived from the 1124 BKA, they were smaller and had only one tank turret, and were always propelled by two gasoline engines. Approximately 20 were in service before the German invasion, with the others taking office during the years 1942 to 1944. A total of more than 150 since the total number of BKAs represents at least 270 units. In 1943, their turrets of T34 were those of model T34 / 85, with longer range. Some had rocket launchers. 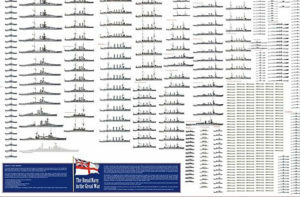 About 90 gunboats 1124 and 1225 will be cast in combat. Propulsion: 2 screws, 2 gasoline engines, 720 hp. These twenty large units, project 161, were intended to operate in the Baltic Sea coast, enlarged versions of the 1124 BKA. 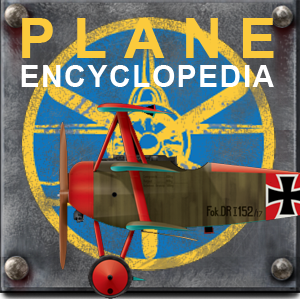 The prototype was built in Leningrad 1941-43 and the others in 1944-45. The latter used guns of 100 mm rather than those of 85 mm. 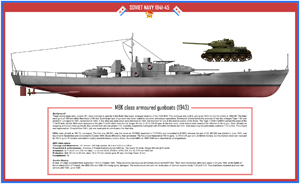 These boats derived from pre-war project 138, originally adapted for quick building in Leningrad, with simplified rectilinear hull form, lend-lease engines and widely available T-34 tank turrets. 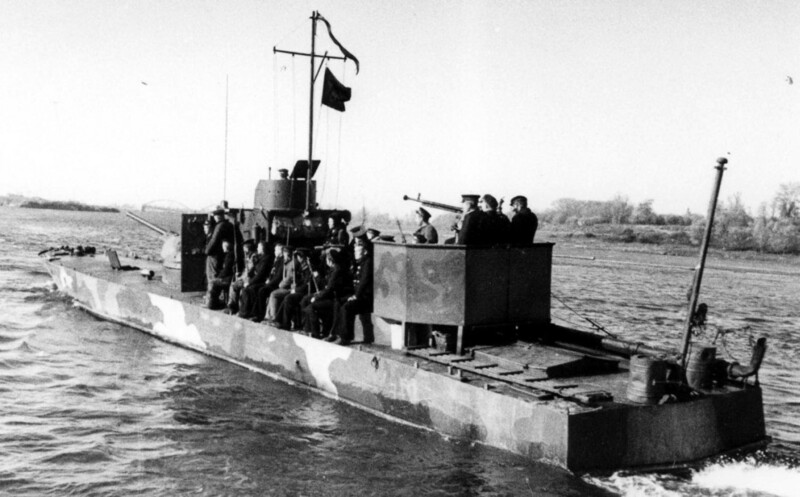 The BKA were better suited to estuarine and coastal operations and the design was essentially an enlarged version of the Type 1124, for use on the shallow waters of the Baltic. The previous type 1124/1125 BKA carried T-34/76 tank turrets, but the BKM was given the much more potente T-34/85 turrets armed with the high-velocity (3.35-in) ZiS-53 gun, and later eventually a 100-mm (3.94-in) gun. Recoil problems were certainly less acute for a large ship than for the suspensions of a tank. The BKA received a substantial protection, 50 mm (2 inches) plates on either sides, and the conning tower, which made them able to compete with German tanks, at least the most common models. In addition to their main 3.35- or 3.94-in gun, they received one 37-mm L/67 AA QF gun and four 12.7-mm (0.5-in) heavy machine guns for anti-aircraft defense.Initially the BKA were given 2 x 82mm mortars, but 45 mm guns were given instead. Two models were apparently built, the early one showing a prominent bow-guard and different armament disposition. They were all built at 194 Yd, Leningrad, the first one, БК-501, being laid down on 10/1942, launched in 11/4/1943 and completed in 9/1943, whereas the last of 20, БК-520 was started in June 1944, launched in September and completed in October 1944. 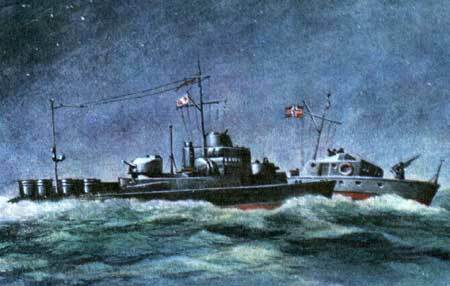 Surviving MBKs in 1946-1949 were classified as small gunboats. Ship protection: Belt had 52-50 mm thickness abreast citadel and was closed by 14 mm fore and 48-30 mm aft bulkheads, it was connected with 35-30 mm deck. Ship ends outside citadel were protected by 18-14 mm belt and 18-12 mm deck. Profile of the MBK-161, early type. Displacement: 151 tonnes standard, 158 fully load. Propulsion: 2 screws, 2 Packard petrol engines 2400 hp. The Battle of Nerva Island (20 june 1944) took place when Germans attacked the Gulf of Finland, sending two large Elbing-class torpedo boat T-30 and T-31. “Operation Drosselfang” had the purposed of “cleaning” light units around Nerva Island. 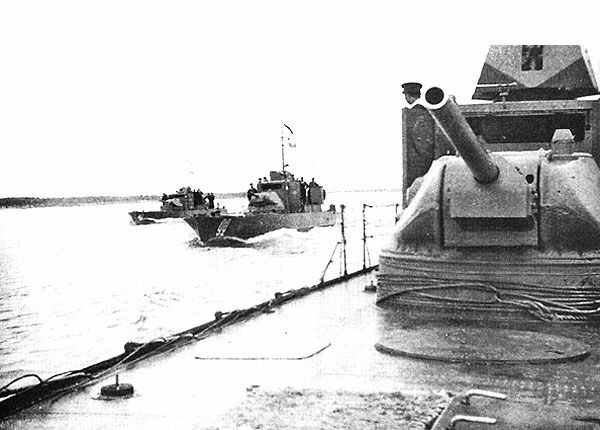 On the area, soviet forces possessed 14 motor torpedo boats, 10 sub chasers (of MO-4 class) and 4 small gunboats. 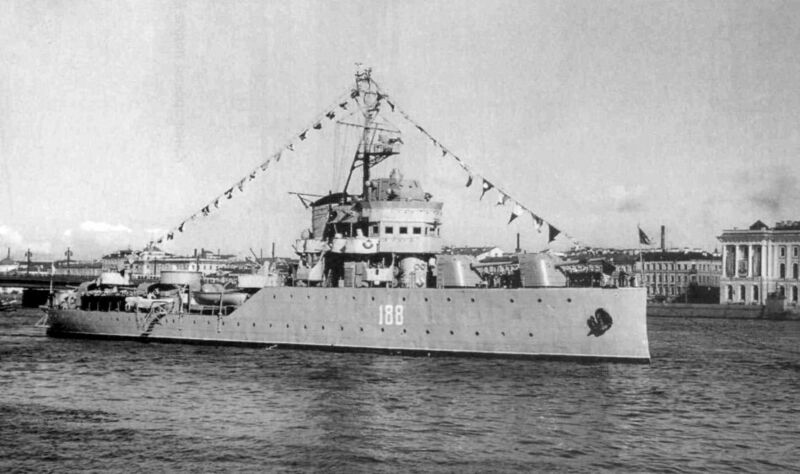 The submarine chaser MO-106 was lightly damaged as well as two small gunboats MBK-503 and MBK-505. At that point, the Soviet counter attacked with the TK-53, TK-63 and TK-153, followed by TK-101 and TK-103, all lightly damaged. Eventually a third attack succeeded with a pincer movement (one sunk, one forced to retreat). The BK-504 was sunk on 4/7/1944, as the BK-509, and the БК-514 by German mines. Surviving ships were renamed on 11/1946 МКЛ-1 to 38, and reverted to their original name on 2/1949. They were eventually all striken from 10/1949 to 3/1958.